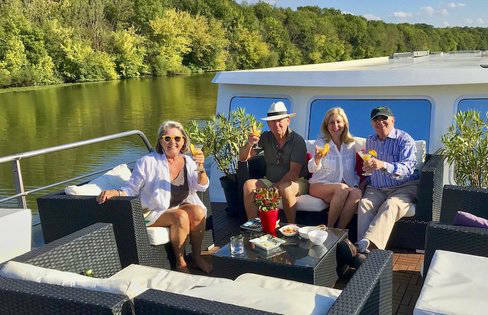 Our all-inclusive barge trips in France are packed with adventure and excitement. Discover the rich flavors and zest for local life. Explore boutique shops and bustling local markets, lunch at the 3-star Michelin Maison Lameloise, tour the legendary Burgundian vineyards and wineries dotting the countryside, and enjoy private tours of historic châteaux. 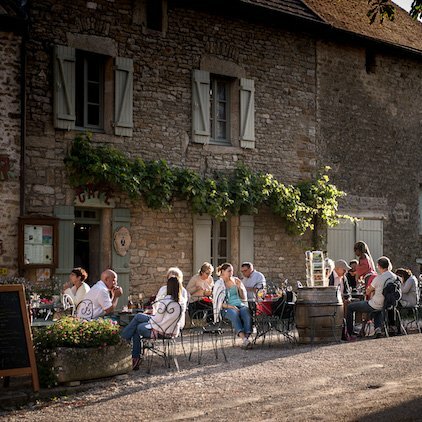 Burgundy is even more beautiful than you might imagine, sharing that special blend of culture and tradition. It’s in the wine but it transcends everything, and you quickly learn that the wine is only where Burgundy’s story begins. The commitment to our guests’ comfort does not end at our gangway. We personally lead guests on tours around Burgundy. Our itineraries are flexible to our guests’ desire and are all-inclusive: focus on the adventure and we focus on everything else. Lunches in Beaune and Dijon are on us. We aim to provide an experience, not just a vacation, and our-hands on attention to detail will ensure our guests return home with a story to share. We focus on great flavors and experiences with each meal. Pairings of fine Chardonnay and Pinot Noir Burgundy wine. Our local sommelier expertly pairs our onboard menu with the finest of selections to enhance each course. Tasting a Burgundy wine is an aromatic experience. Wine tasting is a wonderful way to learn about the diversity of Burgundy wines and uncover the notes to your favorite appellation. Let our private chef tantalize your senses! 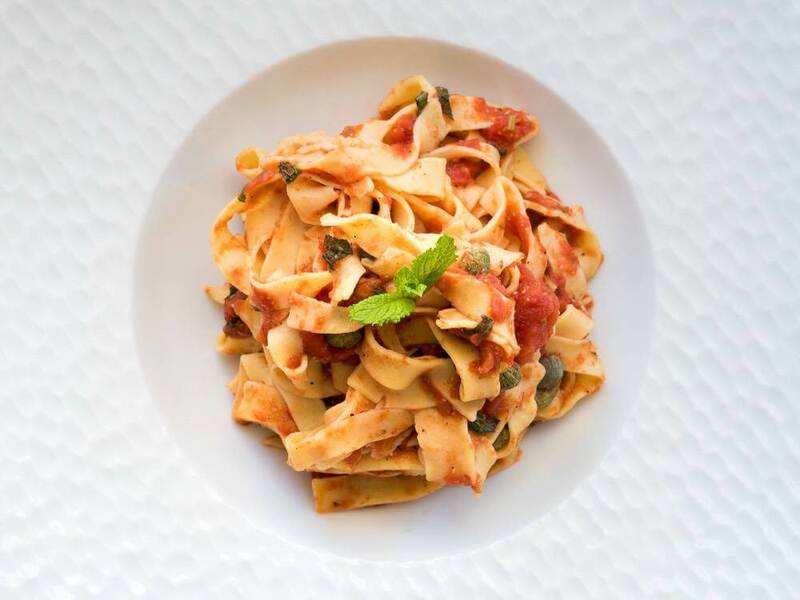 Our menu infuses the simplicity of classic French cuisine with a modern twist and fresh ingredients. Our chef has created a menu that uses ingredients sourced from the Grand Fresh Market and local French bakeries, which is a good indication of the thought put into your gastronomic experience. This emphasis on fresh and local ingredients imparts bold flavors into our dishes ensures the relationship between food and culture. Southern Burgundy is even more beautiful than your imagination. On our itineraries, you’ll take in some of the best destinations for wine lovers. It’s the perfect trip to sample some of the best wines in the world. You’ll spend time in the charming picturesque town of Dijon, France and visit the legendary vineyards of the Côte d’Or. On your privately guided tours, you’ll experience some of the architectural wonders and scenic landscapes France has on offer. Your personal tour guide has picked the crème de la crème of Southern Burgundy’s wineries, towns, and countryside to share with you. 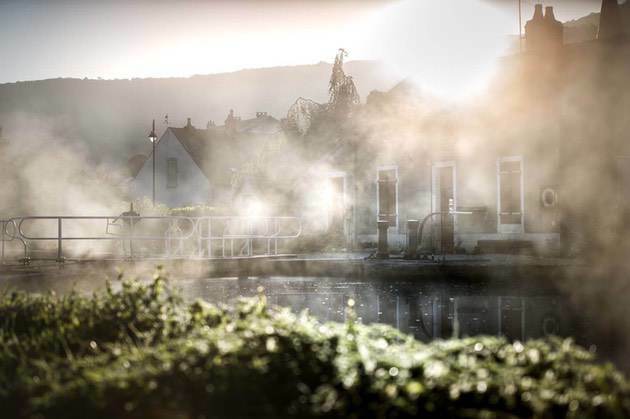 Fall in love with Southern Burgundy during your magical barge cruise! Our private driver meets you in Paris or Geneva to drive you to the Grand Victoria, moored in Dole. Upon arrival, you will be greeted by our cheerful crew and experience our Grand Victoria welcome. While we get you checked in and the crew take your luggage to your stateroom, you’ll have the chance to sit and relax with our signature champagne welcome. Afterwards, there will be plenty of time to unpack and unwind before your first of many incredible dinners on board. Our private driver meets you in Paris or Geneva to drive you to the Grand Victoria, moored in the heart of Lyon. Upon arrival, you will be greeted by our cheerful crew and experience our Grand Victoria welcome. While we get you checked in and the crew take your luggage to your stateroom, you’ll enjoy our signature champagne welcome. After champagne and hors d’oeuvres take a stroll to appreciate this beautiful city as the sunsets or enjoy a fantastic cocktail cruise before your first of many incredible dinners on board. New for the 2018 season, we are proud to offer a Wine Lover's package for our Classic Burgundy itinerary. With an emphasis on the region's wines, our tour through Burgundy will introduce you to the essential knowledge and help you become a regional expert. Explore the unique wines, study food pairings, and learn how to build your private collection at home with us on the trip of a lifetime. Crafted in partnership with a local sommelier, our Wine Lover's tour satisfy wine aficionados and novices alike. A major focus for the tour is the meeting point of fine dining and exquisite wines to tempt the palate. The Grand Victoria's chef prepares every delicious meal with an emphasis on gourmet cuisine perfect for a wine pairing. Every lunch and dinner aboard the Grand Victoria will feature a unique pairing, chosen by a professional sommelier, that highlights some of the region's foremost Grand cru and Premier cru wines. Join him in our demonstration galley and learn some of the secrets to making a mouthwatering meal perfect for serving alongside the region's superb pinot noir and chardonnay wines. Experiencing these wonderful wines in the historic home of both grapes only adds a further appreciation for the terroir that brings forth their best character. Our wine tour is the perfect opportunity to learn more about Burgundy's perfect climats and terroir, with lessons at some of the region's best wine vigneron, or producers. Learn how to build your own personal wine cellar at Château de Pommard, marvel in the history of Burgundy's storied clos at Clos de Vougeot, and discover the secrets of food and wine pairings at Château de Meursault. Together, we'll explore the Côte de Beaune from Gevrey-Chambertin to Nuits St. George; you'll return home with a broader appreciation of Burgundy's complex, well-balanced wines and the artistry behind every bottle. Contact us today to book a wine tour like no other! Round-trip transfers from the specified meeting point in either Paris or Geneva. You’ll get inspiration to excite your love of travel. Take the opportunity to have your travel photos featured on our Instagram account. Just hashtag your posts with #frenchbargevacations so we can see and share them! Over the top...spectacular trip of a lifetime experience. The cabin accommodations were thoughtfully designed and well decorated. Exceptionally clean in all aspects. The very best part was the wine and food....Wines were well presented with histories, geographical significance, etc. before tasting and drinking. Mostly Premium Cru Burgundy as was appropriate. Food was stunningly presented and always very tasty with great diversification. You could tell the Chef was there to impress and impress he did indeed. Shari and I can’t tell you how much we enjoyed our time with you, with Alex and with the other members of the crew. It seemed like the week flew by. We really enjoyed the pace of the whole week. It seems like we did a lot of different things, yet also did a lot of relaxing. The food and the wine were absolutely spectacular. I now have new Burgundy favorites I will be in search of. Your barge and the accommodations are absolutely beautiful. I don’t have any idea how much work it takes to keep such a beautiful vessel in such great shape, but am guessing it’s a never-ending labor of love! Mainly, we felt like we welcomed into your entire crew and family. You both run a fantastic business. A couple of years ago I took my 78-year old dad to the Philippines to get him scuba certified. I told him, “Dad, the problem is you’re starting at the top!” We absolutely know that cruising with you was starting at the top. We hope to return in the near future. We think you’d very much like our goofy friends with some very outsized personalities. Thanks again for such a grand (Victoria) adventure!! I wanted to thank you and the entire crew, for a very special and wonderful time on the Grand Victoria. We were spoiled by all of you every day! The barge is as beautiful as ever, the crew as outstanding as ever, and each day was just perfect as was the weather! Ryan had exquisite menus with such creative dishes and beautiful presentations. Cindy is a gracious and lovely hostess - that is her nature! Kat is a cheerful and hardworking member of your crew - she does everything with a genuine smile! It was good to see Alex again and see how well he is doing - he is a super young man! Rafael did admirably piloting the GV and we knew we knew we were in capable hands under his piloting. And you - always agreeable, knowledgeable and upbeat! We really enjoyed the dual barging routes of cruising on the canals and then the amazingly beautiful Soane River. It was a delightful surprise for us, having only done canals before on our previous barge vacations. I would hope that you would keep that itinerary on our books! Do keep us posted on your itineraries for next Sept.-Oct. I think Chips and I could easily be persuaded to join all of you on the GV once more! All the very best to each one of you! Do give Angus a rub for me! Outstanding!!! On a scale of 1 to 10, this trip tips the scale even past the 10. And, I should add that we are extremely well traveled. Our cabin was beautifully decorated, the bed was very comfortable, the closet and drawers for storage were more than adequate. For a small space, it was quite functional. All crew members were professional, friendly, and accommodating. We felt like we were traveling as VIP's because that's the way we were treated. We are foodies, and we would rate the cuisine with very high marks. The chef gave a couple of cooking demonstrations which we enjoyed immensely. Edward was very knowledgeable about the area, wines, and the best experiences the area had to offer. After dinner each evening, he would talk about what we might see and do the next day, and then he would tailor the excursion to match our interests. We enjoyed everything about the excursions. Everything was handled so professionally. Edward and Cindy have thought of everything to help guests understand what to expect. This was our first barge experience. Edward and Cindy were incredible hosts and their staff is exceptional. The accomdations on the barge are first class. The decor is beautiful. It is very obvious that attention was given to every detail and far exceeded our expectations. The cabins were spacious and the king size bed was very comfortable. 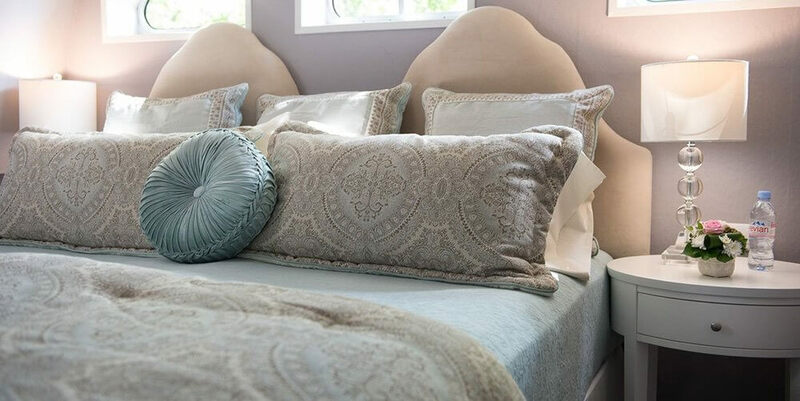 Attention was given to every detail to insure our comfort. The private bathrooms for each cabin were exceptional in design and function! The service was incredible. The staff was always available without being intrusive and far exceeded expectations. The meals were delicious and the wines were always a great accomponiment. The dishes were very well presented with the freshest of ingredients and always pleased the palate. Edward and Cindy were incredible hosts. Edward's personal touch and knowledge of the area made every excursion enjoyable. This owner and their staff is at the top of their game! Highlights of the cruise for us were, Enjoying the comfort of the outdoor furniture on the upper deck after incredible meals making memories to cherish with dear friends with lots of laughter while enjoying the ambiance of onboard two fire pit warmers, all the while enjoying the stars in the night sky and the sounds of nature all around us. Our cruise was fantastic... relaxing, educational and fun. Just cruising was the best. Your staff was professional, yet like comfortable old friends. The food was delicious and I liked the variety and the portions. The first wine excursion was interesting and informative... your knowledge of the local wines was amazing. I am speaking for Bill and me... we would not have wanted another foray into a wine excursion. The information you imparted at each dinner about the wine paired with our meal was very enjoyable and met our " wine education" I felt comfortable being honest with you about changing the itinerary and that you came up with the trip to the artist Paul Day's studio was brilliant. We also loved the Hospice de Beaune and Abbey de la Bussiere. We have talked non stop to all our friends about our great cruise on Grand Victoria. Our love to Cindy and your fantastic crew. Wishing you much success. for a trip of your lifetime? © Waterways & Beyond, LLC. All Rights Reserved.